Finding the best red light therapy devices these days has become a lot harder than it was couple of years ago. The tech was relatively new back then. The devices available for mainstream use were either too expensive or too cumbersome to operate, making them available to a selected few only. Cut to today, there are thousands of portable red light therapy devices in the market. Everybody from celebrities to bored housewives to college students are getting their LED facials done at home. An equal number of people rely on light therapy for Seasonal affective disorder and depression. 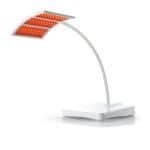 However, most of these devices have mushroomed in the recent past, courtesy the rising demand for light therapy. And a large number of them don’t cut it when it comes to quality and effectiveness. The last thing that you’d want to do is get a nasty burn courtesy an over intense LED light or flush your money down the drain on a device that doesn’t work. You’d be surprised to know that the potential applications of these devices go beyond wrinkle removal. 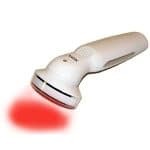 Red led light therapy devices can also help in reducing acne flare ups, speed up wound healing, reduce joint paint and alleviate skin infections without the need for using toxic, side effect inducing medications. Here are the best ones in the market in 2018. 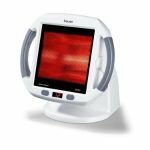 The Trophy Skin RejuvaliteMD is an FDA cleared and clinically approved anti-aging red light therapy device that clubs four light wavelengths to help clear wrinkles and fine lines. The flat LED panel contains four sets of LED bulbs, which are Red (660nm), Yellow (590nm), Amber (630nm) and Infrared (880nm). All four sets illuminate (The infrared one looks unlit) at medium intensity to deliver a therapeutic light spectrum, that speeds up collagen production and helps improve skin tone. The device itself is easy to use and just five minutes of usage per day suffices. This makes it perfect for busy professionals who cannot spend hours at an esthetician for light therapy. What’s so good about this led light therapy device is that there’s zero prep work involved. You can just wash your face, wear the protective goggles, position the LED panel 6-8 inches away from your face and power it on. Five minutes later, the session is done. While the manufacturer recommends multiple sessions a day, we highly recommend that you stick to one session, especially if you have sensitive or acne prone skin. TENDLITE® is a compact, portable red light therapy device that’s become wildly popular in sports medicine. It helps in localized treatment of joint pain and sprains in a completely non-invasive fashion. Imagine never having to use toxic NSAID medications ever again. If you are an athlete or even a senior suffering from debilitating joint pain due to arthritis, then TENDLITE® is hands down, the safest way to a pain free life. The device itself is like a small torch and made of tough stainless steel. It will easily fit into your pocket and It also comes with a dedicated carry case for travel. Using it is a no-brainer. Just wear the protective goggles, shine the device at the site of the pain for a minute and wait for the symptoms to dissipate. It is completely safe and uses the 660nm Red light wavelength that is considered to be most effective for healing joint pain. 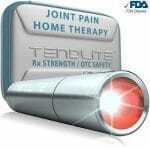 TENDLITE® can be used anywhere, any time and will provide instant relief from stiffness, spasms and pain. The older version of this unit had a problem with the power switch malfunctioning after a few months of use. Well, you’d be pleased to know that this seems to be fixed in the newer device. Also, it comes with a one-year warranty on the stainless steel device and five years on the LED. Reach out to the manufacturer if you have any problems. The Rika LED facial massager is an advanced light therapy device that can be used for cleansing, acne treatment, rosacea and anti-aging. It uses a blend of light therapy, galvanic Ions and a massager to deliver the most intense facial rejuvenation that you can ever get. As we mentioned earlier, there are three ways to use it. 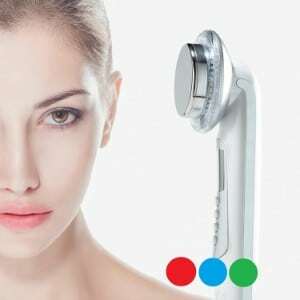 Red light only: When you activate the anti-aging mode, it only uses the Red (630 nm) wavelength and is best suited for increasing blood circulation, which helps in collagen production and wound healing. Blue light only: Activate the Acne treatment mode and it shuts off the other two wavelengths and the blue wavelength (470 nm) kicks on. This is most effective for reducing acne scars, preventing breakouts and reducing acne bacteria from multiplying. Green light only: The green light (520 nm) is best used for anti-aging and reducing the appearance of wrinkles and crow lines on the skin. Toggling between modes is as easy as pressing the mode button a few times and you can also customize the intensity of the light. The manufacturer recommends that you use a liquid serum like hyaluronic acid or Vitamin C before you use the massager on your face. It is easy to use, comfortable to hold and provides excellent coverage for the entire face. One session lasts from 10-30 minutes depending on the intended use. Comes with a 30-day money back guarantee and a 1-year warranty on the device. You must use a serum in liquid form to be able to achieve best results with this. There will be a mild tingling sensation near the hands when you hold the handle. You can prevent this by covering it with a cloth. The Beurer Infrared heat lamp is a very powerful, drug-free pain relief device that uses infrared light therapy to help relieve pain. Unlike the earlier devices in this list, Beurer only uses IR and the heat derived from it. You just need to point the 11.8-inch-long x 15.7-inch-wide screen towards the part of the body that needs treatment, power it on and set the timer. It sets to 15 minutes by default but you can customize the session time from 5-15 minutes. The applications include relieving bronchial congestion when pointed to the chest, symptomatic relief from common cold symptoms when pointed towards the face and localized pain relief from spams, muscle soreness and joint pain when pointed at any part of the body. The ceramic glass covered screen ensures that it doesn’t become unbearably hot. You still need to keep it at least 15 inches away from your body. Also, avoid coming into contact with the glass screen. Two curved soft-grip handles allow you to tilt it 50 degrees on either sides to reach areas that are otherwise hard to target. Consistent heat and very effective! Lifetime warranty on the device. Replacement bulb has to be sourced from the manufacturer itself. It isn’t sold via third party vendors and you have to ship the unit back to the manufacturer to get the bulb replaced. The Nova Red is a handheld red light therapy device for anti-aging and wrinkle reduction. It uses the 660 nm red wavelength which is believed to be most beneficial for collagen production and rejuvenating the skin. Like most handheld red light therapy devices, it is extremely easy to use. Just power it on and target the areas of the face/body that need treatment. It is a cordless device, so you don’t have to worry about being limited by a power cord either. Comes with a rechargeable battery that can be charged by connecting to a computer using a USB cord or via the charger included in the pack. While the intensity of the light cannot be controlled, you can switch between continual and pulse modes. The pulse mode reduces the therapy time in half by making timed pauses. The Nova Red also has a very unique feature, that of a light emission control sensor which automatically powers the unit off when exposed to the eye. This eliminates the need for protective eyewear. Overall, the features are unbeatable at the price. The nearest competition is priced at least double of what this costs. This is only effective when used for anti-aging and wrinkle reduction. It will not work for pain management. If you are looking for a device for multiple uses, check out some of the others in this list. If you know what you are looking for and have set the right expectations, then selecting the best red light therapy device becomes a lot easier. You just need to be aware of the applications of the unit you choose and its limitations as well. The most important factor is the intended use of the led light therapy device. What works for anti-aging may not work for pain relief. That’s because these devices use different wavelengths of light. Some devices also use a combination of different wavelengths, like the Rika LED facial massager and the Trophy Skin RejuvaliteMD. You can choose from a handheld light therapy device like the TENDLITE and the Nova Red or stationary units like the Beurer Infrared device. That depends on the convenience you seek and your availability to perform sessions every day. If you are short of time, a handheld device may work better. The caveat is that due to the limited surface area of the LEDs, you might have to make multiple passes to cover the entire face or larger body parts. Stationary devices have larger LED panels that allow you to cover large body parts easier. We have never allowed the price of a product to affect or sway our choice. But when it comes to LED light therapy devices, there are many in the market which are grossly overpriced. So, we have only picked units that are priced reasonably. Let’s face it. The technology is more readily available now and you don’t need to spend thousands of dollars to buy celebrity endorsed devices. Cheaper devices work equally well. Red light therapy devices are effective. But you need to ensure that you buy devices that use optimal wavelengths at output strengths that are strong enough to stimulate the effects that you seek. All the devices in this list give you more bang for your buck. Do write to us with your results and experiences with red light therapy. 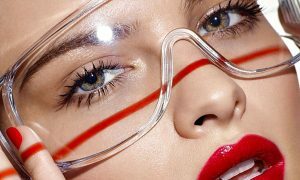 If red light therapy isn’t working for you, try out some of our Light Therapy Lamps or Light Therapy Glasses!